I really enjoy reading historical fiction and I spent a few hours with this one over the holidays -- an absorbing and exciting read with lots of nail-biting moments. Marcel loves riding his bicycle, whether he's racing through the streets of his small town in France or making bread deliveries for his parents' bakery. He dreams of someday competing in the Tour de France, the greatest bicycle race. But ever since Germany's occupation of France began two years ago, in 1940, the race has been canceled. Now there are soldiers everywhere, interrupting Marcel's rides with checkpoints and questioning. Then Marcel learns two big secrets, and he realizes there are worse things about the war than a canceled race. When he later discovers that his friend's entire family is in imminent danger, Marcel knows he can help — but it will involve taking a risky bicycle ride to pass along covert information. And when nothing ends up going according to plan, it's up to him to keep pedaling and think quickly... because his friend, her family, and his own future hang in the balance.. 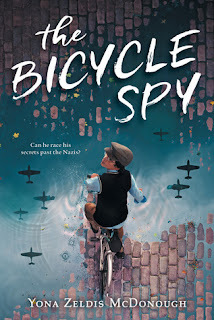 The Bicycle Spy was written by Yona Zeldis McDonough and published by Scholastic Press in 2016. I couldn’t put this book down! It’s a compelling story that brings to life the fear and reality of what it was like to live in France during 1942. Marcel was brave and courageous, and I loved how his passion for riding bicycles and the Tour de France was an integral part of the story. From the moment Marcel discovers a secret about his family, he is afraid about what he must do, but he takes on the challenge, even when at times he has to do it on his own and without the security and guidance of his parents. This would be a great book to start or deepen discussions about prejudice, persecution and basic human rights. The back matter contains a brief history of World War II as well as of the Tour de France. Historical fiction can sometimes be more interesting than compelling, but this story was both. I loved how the author created suspense and drama through the use of specific details. Yona Zeldis McDonough has written 27 books for children. They include The Doll With the Yellow Star, The Dollhouse Magic, Little Author in the Big Woods: A Biography of Laura Ingalls Wilder, and Who Was Rosa Parks? This does sound riveting, something historical fiction doesn't always pull off. I'll have to check it out. I love an engaging historical fiction story and this one fits perfectly. I've added it to my list of books to read this year. Thanks for sharing. This sounds like an interesting POV. I'm going to add this to my MMGM review for today, in-keeping with the WW II theme. Thanks for your timely pick! It's funny how we were on the same wavelength! OOH! this looks cool. Definitely putting on my list of books to read. Nope - scratch that - gonna hunt it down and find a copy ASAP. I love historical fiction and I like the different angle for this WW II story. Sounds like an exciting read -- a boy and his bike. Will check this out. Several of us have WW II picks today. Love the quotes you included. It shows us how exciting this book must be. WWII, France, AND the Tour de France: that's a winning combination. Yes, exactly! It seems like it will be interesting to boys, which is always good! I know I would enjoy this. Children in the resistance in France is a fascination of mine. You might also enjoy a similar read - BLACK RADISHES by Susan L Meyers. Thanks for the recommendation! I'm always looking for new books to read. Hi, Andrea. I love historical fiction and this sounds like one I would like. Thanks for the review. This book sounds really good! It seems like it has an original premise. Thanks for the review!